Over sixty people, including Australia’s 2014 Commonwealth Games Mountain Bike (MTB) coach, cycling groups, politicians, a Commonwealth Games organisation representative and supporters celebrated the opening of new Redland Track Park Trail Head additions with hot coffee and croissants this morning. The new trail heads provide shelter, bike racks, bike repair stations, maps and information, water and a place to meet. 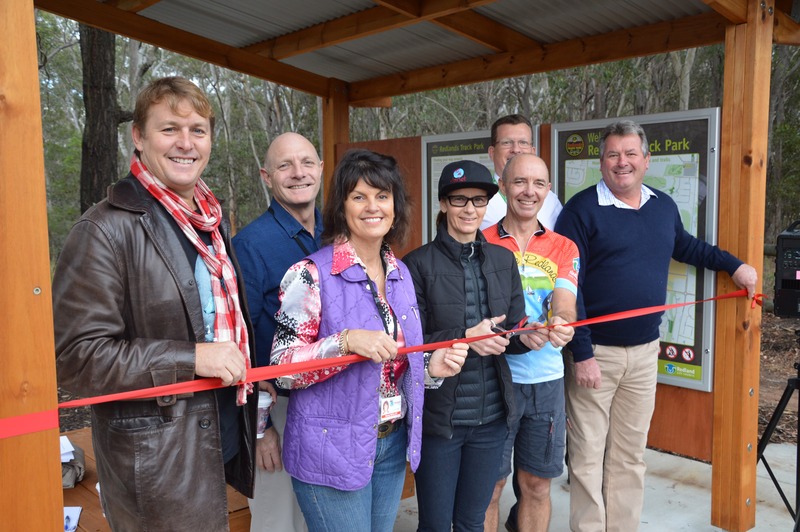 Helping to launch the new facility, Division 1 Councillor and Deputy Mayor Wendy Boglary said the Redlands had 31km of MTB, walking and horse trails at Redlands Track Park and 51kms at Bayview Conservation Area. “With a rapidly increasing number of trails visitors, including to this weekend’s Bayview Blast cycling event with an expected 500 participants, these new trail heads, trails, and signage will continue to enhance the Redlands visitor experience. “The Bayview Blast will see riders ranging from children and families to beginners and the most experienced test their skills and endurance over courses of a few kilometres to circuits of 50 and 100 kilometres. “This is reinforcing the Redland’s tourism and visitor attractions by promoting the city as South East Queensland’s foremost recreational and sports cycling destination of choice. Regular trail rider, Australia’s 2014 Commonwealth Games Mountain Bike (MTB) coach and Redland City local Donna Dall, said the Redlands offers wonderful facilities for all forms of cycling and training. “Our weekly group rides on the Redlands trails are fun socially and help to satisfy my own passion for cycling as well as offering great options for training with trails for all grades of riders. Division 2 Councillor Peter Mitchell said the Redlands has been voted as an “A” for best mountain trail bike destination in South East Queensland and the best for council support in the SEQ Trails Association MTBs report card. “Only a little more than a month ago a large number of spectators watched as 200 of Queensland’s top cycling competitors raced a tight 1.1km twilight criterium circuit in Cleveland under lights. Division 7 Councillor Murray Elliott, who also shared a new Redland Track Park trailhead facility in his Division, said the growing attraction of these trails was also a compliment to the dedication of trails riders who have volunteered over many years to protect and enhance the trails. The Enhancing the Visitor Experience (EVE) program, is an action identified in the Redland City Tourism Strategy and Action Plan 2015–2020, designed to improve the experience for tourists visiting the city’s natural attractions. The program will deliver projects and services over three phases that open up the value of parks and natural areas for people’s enjoyment, health and well-being while protecting the Redlands’ environmental biodiversity. Upgrading local trails such as the popular Redlands Track Park and Bayview Conservation Area is part of the program. Posted in Community, Council, Parks and tagged mountain bike, mtb, Redland Track Park.